MInami Takahashi (AKB48) to release solo album Aishitemo Ii Desu Ka? Gung Ho North America has announced the launch date of the highly-anticipated Rurouni Kenshin collaboration, with special characters and dungeons available from September 5 – September 19. The insanely popular mobile game has achieved over 10 million downloads, and recent North America collaborations have included Batman v. Superman, Final Fantasy, and Fist of the North Star. Japan is in a constant state of discord as the Meiji Era continues to move forward. A sober swordsman desperate to atone for his sins must fight to protect all those in need as well as those that he holds most dear. Himura Kenshin, also known as the Hitokiri Battosai or Manslayer, has vowed to never use his sword to kill again. But when a new villain threatens to incite war and take over Japan, only Kenshin and his friends can fight to save their country! But, will he be able to defeat this threat without killing him? This collab comes with a brand new Dungeon and Rare Egg Machine! Travel to Kyoto with your favorite Rurouni Kenshin characters and save Japan from the devilish Shishio Makoto! 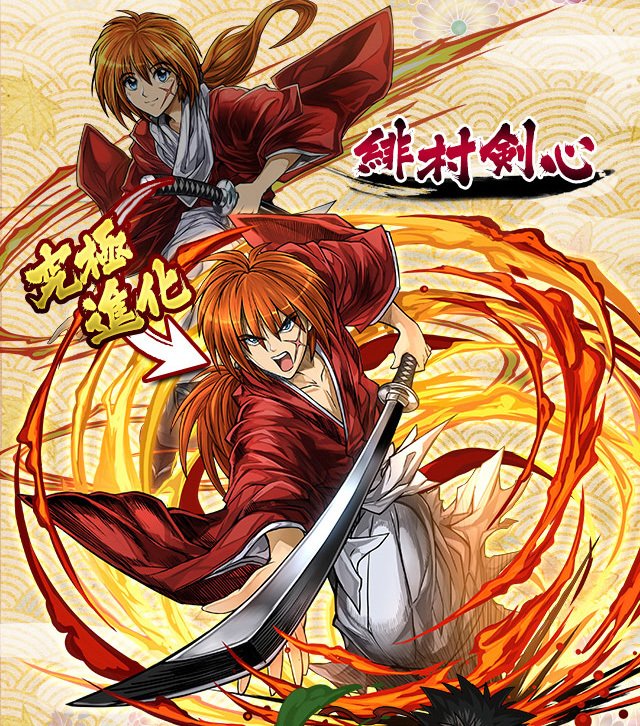 Take this chance to obtain your Rurouni Kenshin warriors such as Sagara Sanosuke, Kamiya Kaoru, Himura Kenshin, and many more! An extremely popular and super addictive freemium game with over 30 million downloads in Japan and ranked as one of the top grossing apps, Puzzle & Dragons combines the key elements of a puzzle game, a dungeon-crawling RPG, and monster collecting adventure. Players will command a team of monsters as they explore countless dungeons, collect treasure and battle a variety of powerful foes along the way. Slide colorful orbs across the screen until 3 or more are adjacent to attack foes. Strategize team building and make full use of the opponents’ elemental weaknesses to deal massive amounts of damage. If players manage to survive through the epic boss fights, the spoils of victory await.